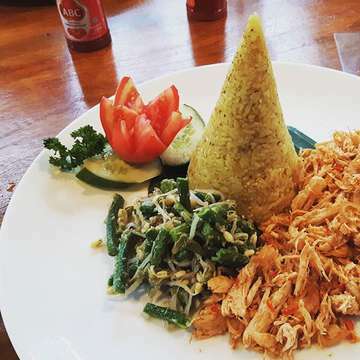 Bebek Bengil Is A Balinese Restaurant, Originally From Ubud, Bali, Which Opened A Branch In Jakarta In 2009. It Was Quite A Challenge To Re-Create A Balinese Atmosphere In Central Jakarta With The Pollution And The Traffic, But The Final Result Is Not Bad. The Specialty Of Bebek Bengil (Which Means "Dirty Duck") Is The Crispy Duck. It Is Worth Trying For Its Relaxing Outdoor Garden. 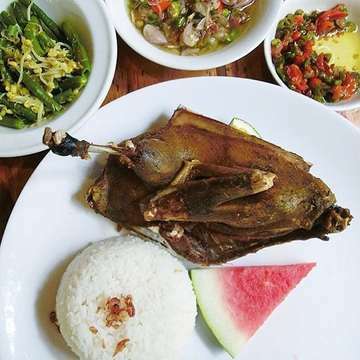 Naturally, It Is Also Recommended If You Are A Fan Of Balinese-Style Crispy Duck. Open Everyday, 11Am To 11Pm. When I started taking my first bite, I immediately stopped talking to everyone around me. The duck was perfectly cooked and the sambal was just TOO GOOD. I'm not a big fan of veggies but their veggies WERE AMAZING!!!!!!!! !